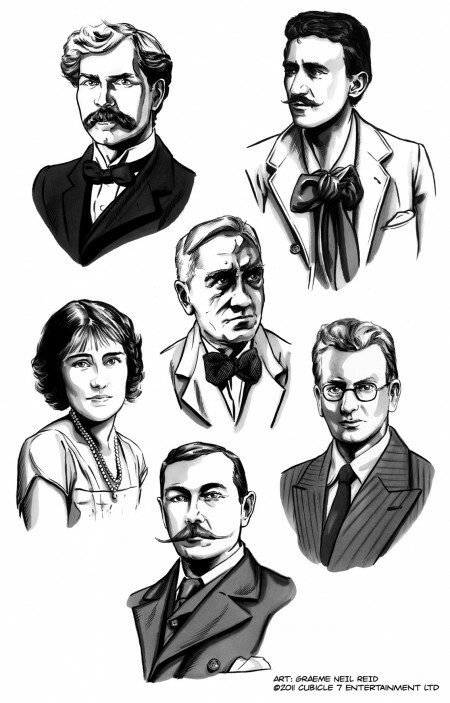 I recently produced six portrait pictures for a gaming supplement called Shadows over Scotland for Cubicle 7’s Cthulhu Britannia game and I’ve had special permission to show you them before it see’s print. From top left we have the wonderfully mustachioed Ramsay MacDonald, then hopefully a familiar face to artists out there Charles Rennie Mackintosh. In the middle is Sir Alexander Fleming followed by Lady Elizabeth Bowes-Lyon (or as you might remember her The Queen Mother) and John Logie Baird. Lastly but not least we have Sir Arthur Conan Doyle. These were a mixture of pencil, ink, markers and photoshop.